The bulk of this double book is looking at the limited and contradictory writings of Marx/Engels and Mao on the subject of the lumpen with greater historical context. MIM(Prisons) and others have analyzed their scattered quotes on the subject. (1) But Sakai’s effort here is focused on background research to understand what Marx, Engels and Mao were seeing and why they were saying what they were saying. In doing so, Sakai provides great practical insight into a topic that is central to our work, the full complexities of which have only begun to unfold. In the opening of the “Dangerous Class”, Sakai states that “lumpen/proletarians are constantly being made in larger and larger numbers”. (p.3) This follows a discussion of criminalized zones like the ghetto, rez or favela. This is a curious conclusion, as the ghettos and barrios of the United $tates are largely being dispersed rather than expanding. Certainly the rez is not expanding. Sakai does not provide numbers to substantiate these “larger and larger” lumpen populations today. In our paper, Who is the Lumpen in the United $tates? we do run some census numbers that indicate an increase in the U.$. 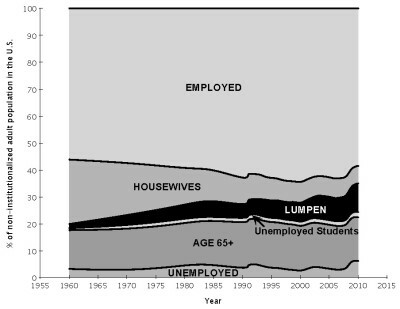 lumpen population from 2.5% of the total population in 1960 to almost 10% in 2010. However, other methods led us to about 4% of the U.$. population today if you only look at oppressed nation lumpen, and 6 or 7% if you include whites. (1) This latter number is interestingly similar to what Marx estimated for revolutionary France (around 1850)(p.66), what Sakai estimates for Britain around 1800(p.112), and what Mao estimated for pre-revolutionary China. (p.119) Is 6% the magic number that indicates capitalism in crisis? The historical numbers for the United $tates (and elsewhere) are worthy of further investigation. Sakai’s first book spends more time on the French revolution and the obvious role the lumpen played on the side of repression. Marx’s writings on these events at times treated the Bonaparte state as a lumpen state, independent of the capitalist class. This actually echoes some of Sakai’s writing on fascism and the role of the declassed. But as Sakai recognizes in this book, there was nothing about the Bonaparte government that was anti-capitalist, even if it challenged the existing capitalist class. In other words, the mobilized lumpen, have played a deciding role in revolutionary times, but that role is either led by bourgeois or proletarian ideology. And the outcome will be capitalism or socialism. Interestingly, Sakai does not address the First World class structure and how that impacts the lumpen in those countries. Our paper, Who is the Lumpen in the United $tates? explicitly addresses this question of the First World lumpen as distinct from the lumpen-proletariat. While MIM changed its line from the 1980s when it talked about significant proletariats within the internal semi-colonies of the United $tates, this author has not seen Sakai change eir line on this, which fits in with eir discussion of a lumpen-proletariat here. Sakai’s line becomes most problematic in eir grouping of imperialist-country mercenaries in the “lumpen”. Ey curiously switches from “lumpen/proletariat” when discussing China, to “lumpen” when discussing imperialist-country mercenaries, but never draws a line saying these are very different things. In discussions with the editor, Sakai says the stick up kid and the cop aren’t the same kind of lumpen. (p.132) Sure, we understand the analogy that cops are the biggest gang on the streets. But state employees making 5 or 6-digit incomes with full bennies do not fit our definition of lumpen being excluded from the capitalist economy, forced to find its own ways of skimming resources from that economy. The contradiction the state faces in funding its cops and soldiers to repress growing resistance is different from the contradiction it faces with the lumpen on the street threatening to undermine the state’s authority. The inclusion of cops and mercenaries in the lumpen fits with Sakai’s approach to the lumpen as a catchall non-class. We do agree that the lumpen is a much more diverse class, lacking the common life experience and relationship to the world that the proletariat can unite around. But what’s the use of talking about a group of people that includes Amerikan cops and Filipino garbage pickers? Our definitions must guide us towards models that reflect reality close enough that, when we act on the understanding the model gives us, things work out as the model predicts more often than not. Or more often than any other models. This is why, in our work on the First World lumpen in the United $tates, we excluded white people from the model by default. We did this despite knowing many white lumpen individuals who are comrades and don’t fit the model. The analysis of the First World lumpen in this collection is a reprint of Sakai’s 1976 essay on the Blackstone Rangers in Chicago. Sakai had referred to L.O.s becoming fascist organizations in New Afrikan communities in a previous essay, and this seems to be eir basis for this claim. While the essay condemns the Blackstone Rangers for being pliant tools of the Amerikan state, Sakai does differentiate the young foot soldiers (the majority of the org) from the Main 21 leadership. In fact, the only difference between the recruiting base for the Rangers and the Black Panthers seems to have been that the Rangers were focused on men. Anyway, what Sakai’s case study demonstrates is the ability for the state to use lumpen gangs for its own ends by buying off the leadership. There is no reason to believe that if Jeff Fort had seen eye-to-eye with the Black Panthers politically that the youth who followed him would not have followed him down that road. Relating this to our practice, Sakai discusses the need for revolutionaries to move in the realm of the illegal underground. This doesn’t mean the underground economy is a location for great proletarian struggle. It can contain some of the most egregious dehumanizing aspects of the capitalist system. But it also serves as a crack in that very system. As comrades pointed out in our survey of drug use and trade in U.$. prisons, the presence of drugs is accompanied by an absence of unity and struggle among the oppressed masses. Meanwhile effective organizing against drug use is greatly hampered by threats of violence from the money interests of lumpen organizations and state employees. (2) The drug trade brings out the individualist/parasitic tendencies of the lumpen. Our aim is to counter that with the collective self-interest of the lumpen. It is that self-interest that pushes oppressed nation youth to “gang up” in the first place, in a system that is stacked against them. While Mao faced much different conditions than we face in the United $tates today, the story of alliances and betrayals during the Chinese revolution that Sakai weaves is probably a useful guide to what we might expect. Ey spends one chapter analyzing the Futian Incident, where “over 90 percent of the cadres in the southwestern Jiangxi area were killed, detained, or stopped work.”(p.205) The whole 20th Army, which had evolved from the lumpen gang, Three Dots Society, was liquidated in this incident. It marked a turning point and led to a shift in the approach to the lumpen in the guerilla areas. While in earlier years, looting of the wealthy was more accepted within the ranks of guerrilla units, the focus on changing class attitudes became much greater. (p.208) This reflected the shift in the balance of forces; the development of contradictions. For now we are in a pre-war period in the United $tates, where the contradictions between the oppressed and oppressors are mostly fought out in the legal realms of public opinion battles, mass organizing and building institutions of the oppressed. Through these activities we demonstrate another way; an alternative to trying to get rich, disregarding others’ lives, senseless violence, short-term highs and addiction. We demonstrate the power of the collective and the need for self-determination of all oppressed peoples. And we look to the First World lumpen to play a major role in this transformation of ourselves and society. 1. Who is the Lumpen in the United $tates? by MIM(Prisons).